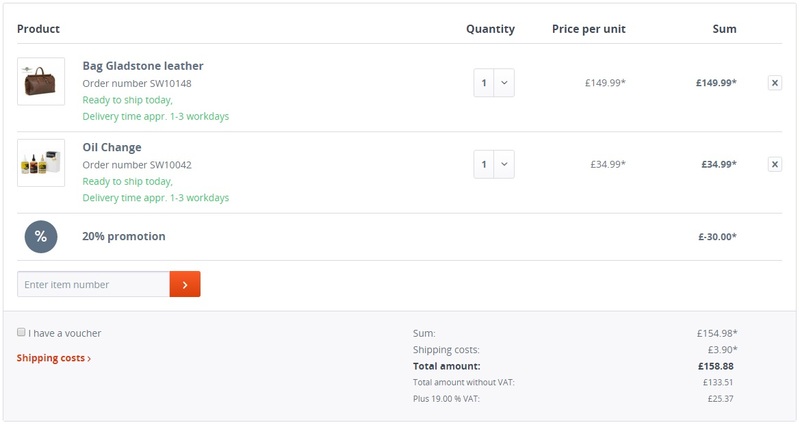 The plugin Advanced Promotion Suite allows you to create discounts and campaigns for various occasions in your online shop. The following documentation clarifies the possibilities of this plugin and how it works in practice. The module can be found under the menu point Marketing > Advanced Promotion Suite. 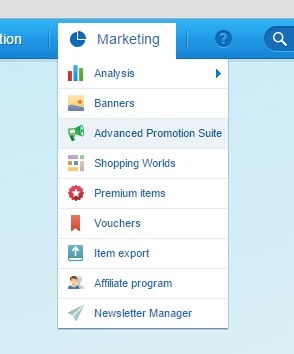 When you open the module, you will first see an overview of all currently applied promotions. 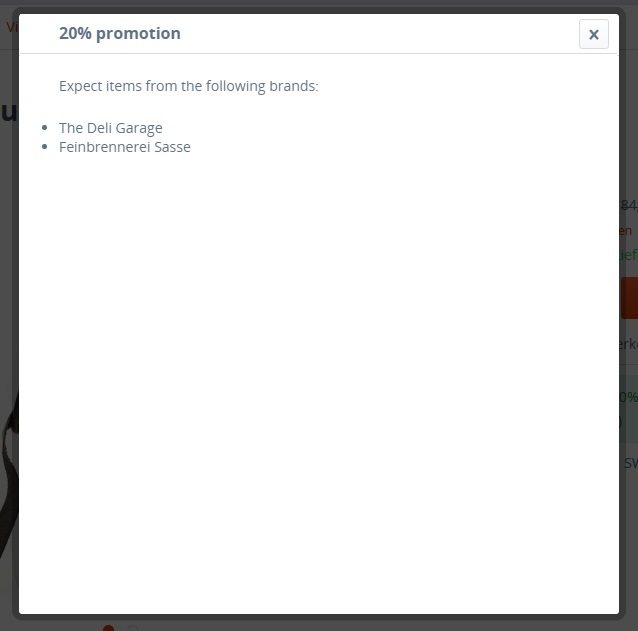 If this is your first time opening the module, the promotion list will appear empty. Similar to other Shopware modules, these parameters can be sorted manually. 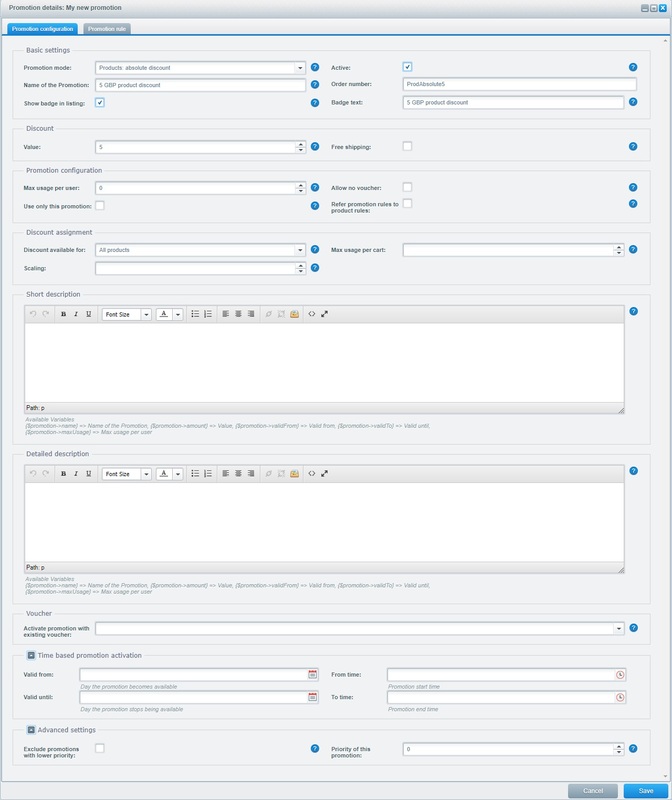 To change the sorting, click on the parameter and drag to reposition it within the headline list. 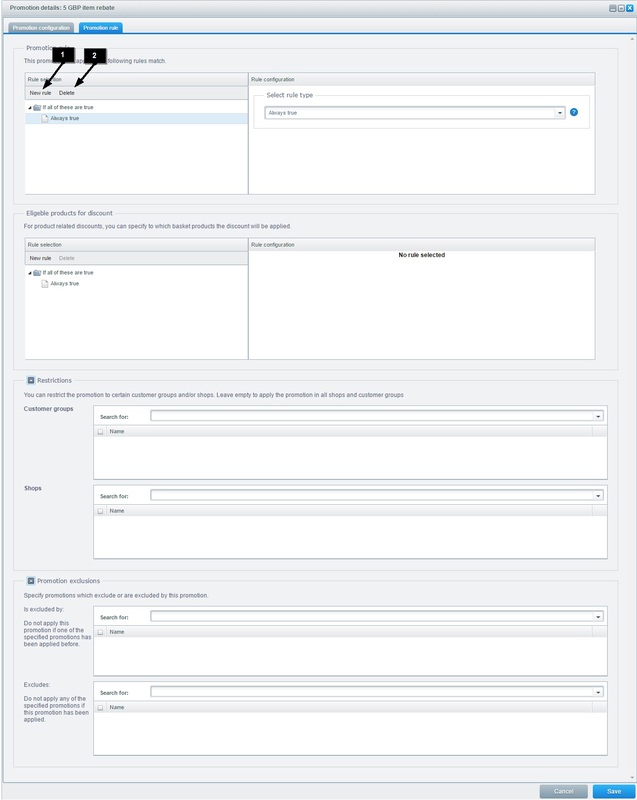 Using the search box, you have the option of searching for a specific promotion that has already been created. 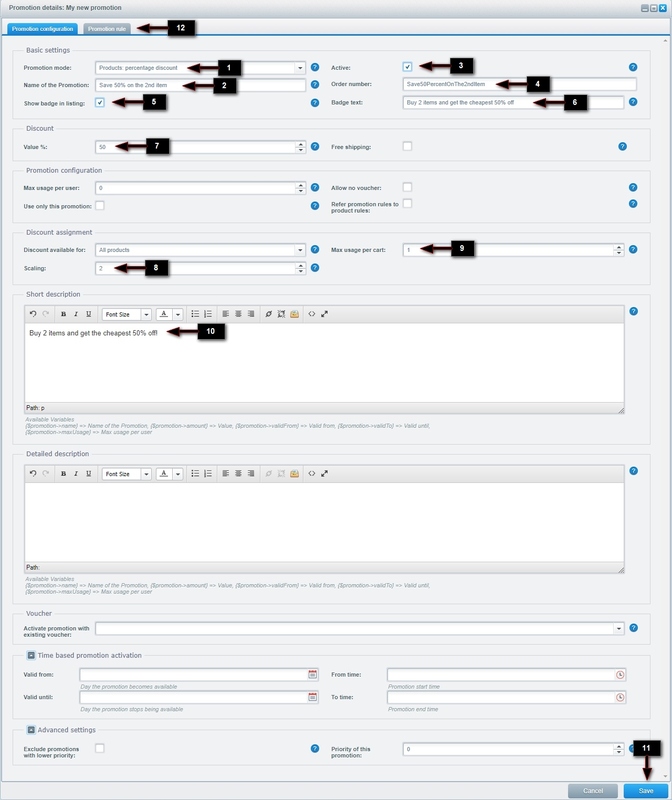 You can define the conditions of your promotion in the configuration area (i.e. the discount or if the campaign offers free shipping, etc.). Note that several areas can be set within the range of modes. 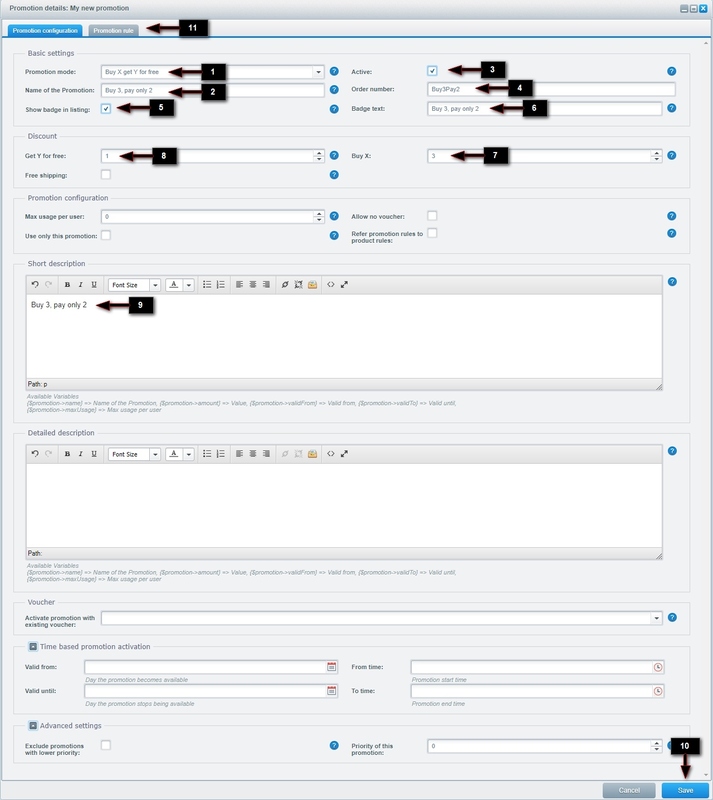 Some fields do not apply for every mode, and therefore are not displayed in particular configurations. Below is an example of the different modes and settings. Here you will find a helpful tutorial on how to create a promotion. Allow no voucher: when active, no other voucher can be used in combination with this promotion. If inactive, a maximum of 1 voucher can be redeemed in parallel with this promotion in the shopping cart. Use only this promotion: when this option is activated, no other promotion can be used. Discount available for: here you select whether the promotion is valid globally or for main products/variants. This is important because in the product rules you cannot select a variant (see below). 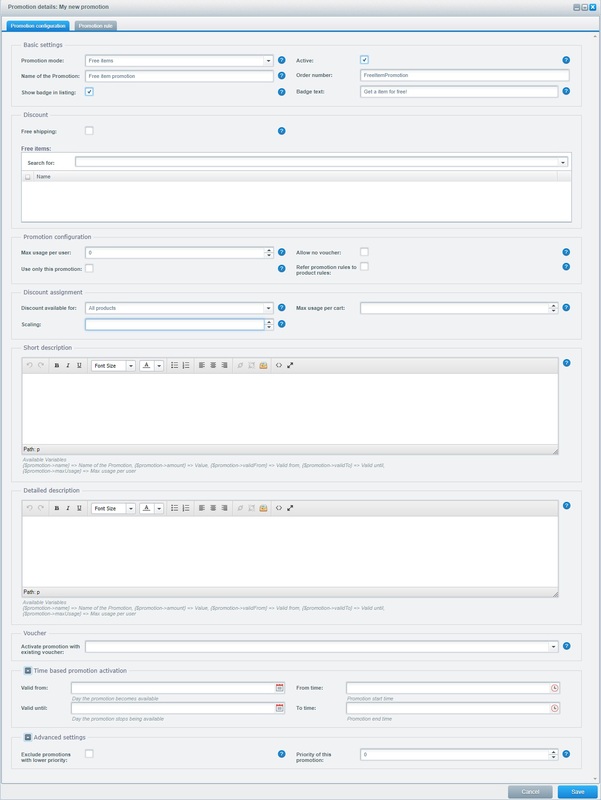 Detailed description: depending on the device being used, this description will appear either off-canvas or in a modal box. This description can be used as a disclaimer. Activate promotion with existing voucher: defines that the promotion will activate with an assigned voucher. 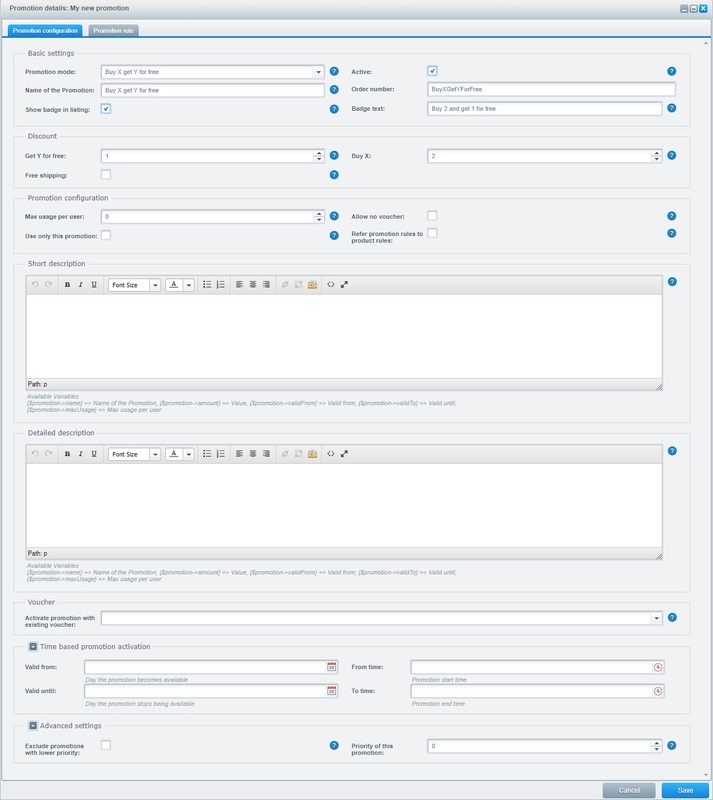 The voucher is used only for activation, the voucher conditions do not apply. Time based promotion activation: here you can define the specific time the promotion begins and ends. Exclude promotions with lower priority: when activated, promotions with a lower priority will be excluded from the shopping cart. Priority of this promotion: defines the priority of the promotion. The higher the priority, the more likely it will be considered. If you let the "Badge Text" field empty, the default text "Campain" appears in the badges. By variant > 3x the same variant, After master product > 3x the same product, regardless of variant, All products > products from the same campaign. Refer promotion rules to product rules: With this option the product rules will referred to the cart rules. Example: You have a cart rule Total price > 50 and a product rule Supplier name = XY. When the option is disabled, these rules will be evaluated seperately, the cart must be > 50 and at least contain 1 product from supplier XY, no matter what it's price is. 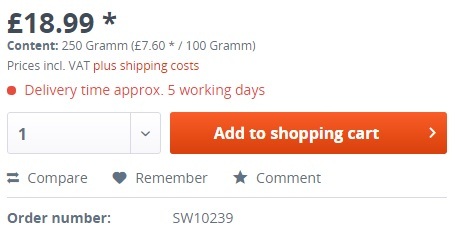 If you activate this option, Shopware checks that all products from supplier XY have a total price of > 50. 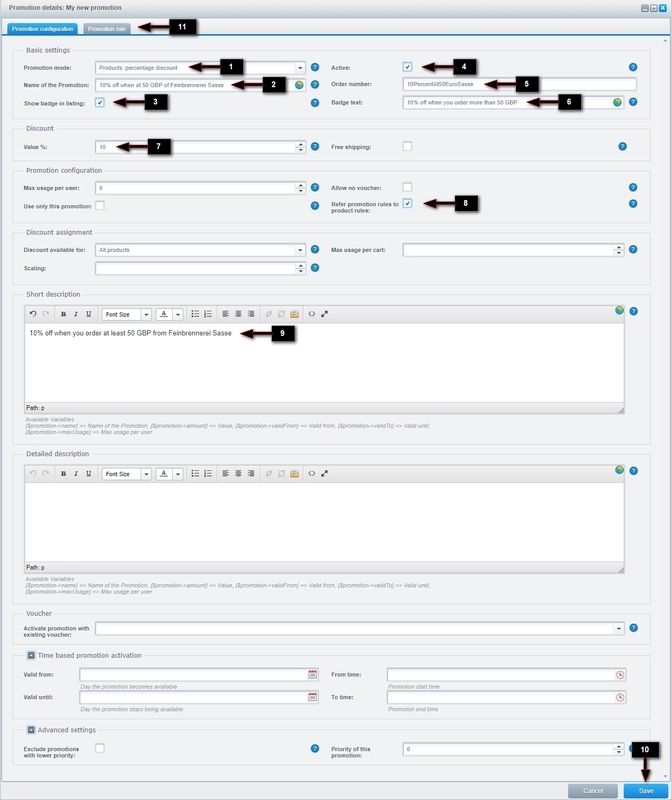 Using this you can link both rulesets and start completely new types of promotions. 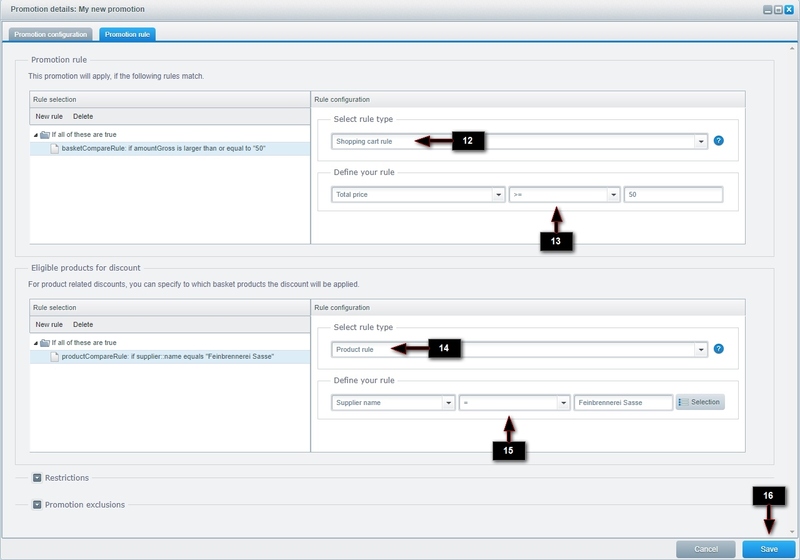 Scaling: here you set how many products must be purchased in order to activate the promotion (i.e. “Buy 5, get 10% discount”). In the shopping cart, the free item will always appear with its full price plus a separate voucher of equal value. The conditions that must be met in order to activate the promotion are defined in the promotion rules (i.e. a promotion activates when a certain shopping cart value is met / there is a particular item in the cart). 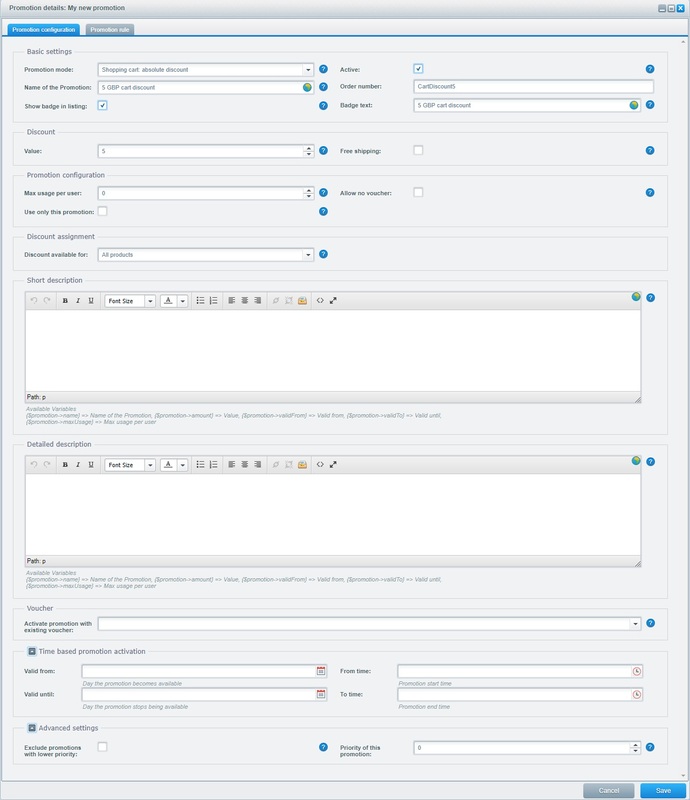 Here you can select between promotional rules (shopping cart or user rules) and product rules – you are also able to combine rules for even more specific promotions. The promotion will only be active when all of the rules are met, therefore if you do not want to define product rules, select “Always true”. The rules can be branched as a tree structure or combined using “AND” and “OR”. AND: when all sub-rules are met – if you choose this, all rules under the node must be met in order for the node to apply. OR: if one of the sub-rules are met – if you choose this, it’s enough if only one of the entered sub-rules are met. Always true - when selected, this is usually always true. When only one shopping cart or product rule is defined, all of the other rules will also apply. You can create and combine any number of rules in order to perfectly control your campaign. The product rules behave similar to the shopping cart rules, as they can be used to more accurately control your promotion. Nevertheless, you can still use just one standalone product rule. AND: when all sub-rules are met – if you choose this, all rules under the node must in order for the node to apply. Always true – when selected, this is usually always true. When only one shopping cart or product rule is defined, all of the other rules will also apply. The price filter is always stated net since the result would almost never be “true” by rounding the price! In the restrictions section, you can determine whether your promotion should be restricted to specific customer groups or shops. Enter the customer groups/shops the promotion should be restricted to here. Set old price as new pseudo price – this sets the old price as a pseudo price and displays the discounted price. Only highlight new price – this setting displays only the new price; the pseudo price will be hidden. Note: this setting is always global for active promotions. You have to make sure that your promotions fulfill the legal requirements for displaying prices with a strikethrough. 1. First define the type of promotion. In this case, you need a percent discount on a product basis. 2. Enter the name of the promotion. 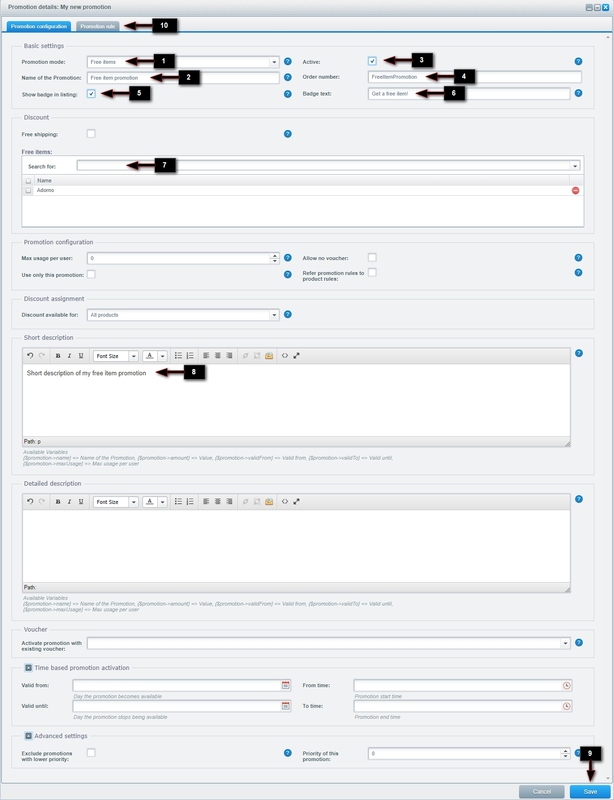 This will be issued in the backend but also appear in the header of the extended description modal box in the frontend. 4. Define the order number that appears when an order is placed. Please pay attention to Shopware’s order number specifications. 6. Enter the text that should be displayed on the badge. 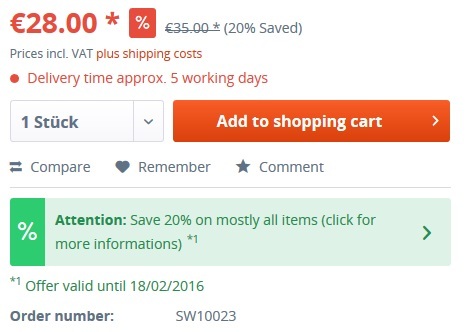 For this example "20% off for nearly all items!". 7. Define the value of the promotion. In this case, it is set to 20. 8. Write a brief description, which will be displayed on the product detail page as a small box under the “Add to cart” button. 9. If necessary, write a detailed description. 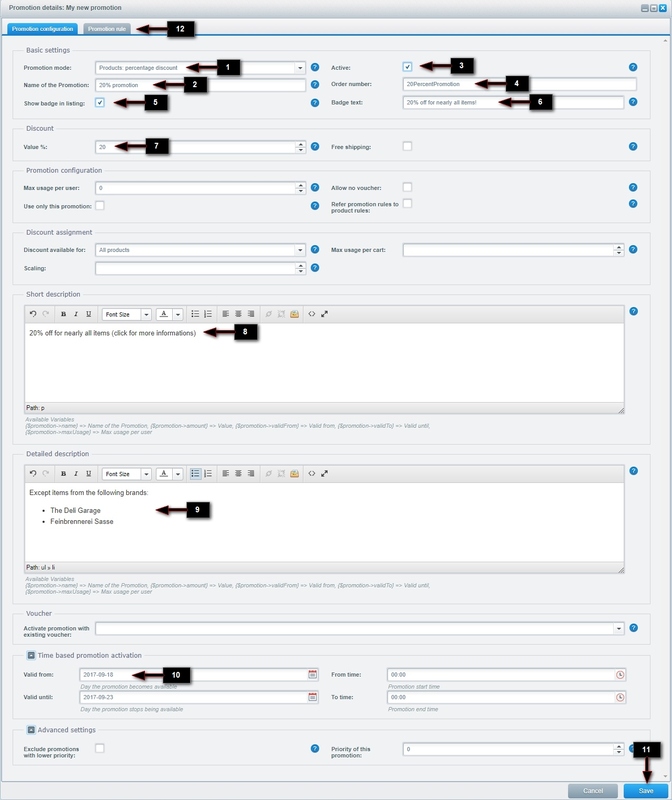 In the frontend, the short description will be clickable – should the customer click the short description, the detailed description will appear in a modal box. 10. Set the time limit of the promotion. In this example it is set for 24 hours. 12. Switch to the “Promotion rules” tab. 13. Define a product rule and switch to the tab “Promotion rules”. 14. Now define the rule itself. Here it is: Manufacturer is not from the Deli Garage | Feinbrennerei Sasse. You can fill in the individual values themselves (divided by "|" or click on a selection and pick out the desired entry from a list. 15. Finally, you save your promotion. After saving it will appear in the frontend. 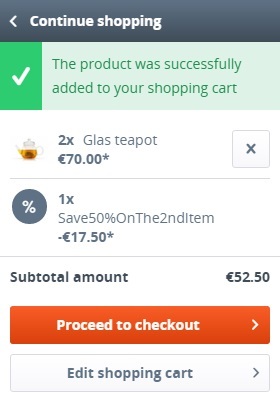 When the customer completes their purchase, the discounts for the products that aren’t from the defined brands will appear as separate items in the shopping cart. 1. First define the type of promotion. For this example you need the mode “Buy X get Y free”. 2. Define the name of the promotion. 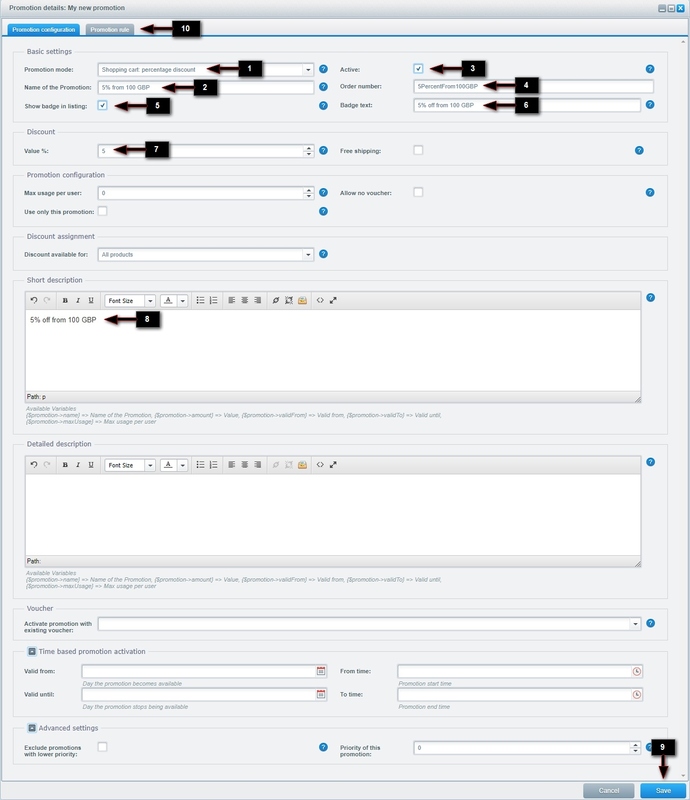 This will appear in the backend as well as in the header of the modal box of the detailed description in the frontend. 3. Set the promotion to active. 6. Enter the text that should be displayed on the badge. 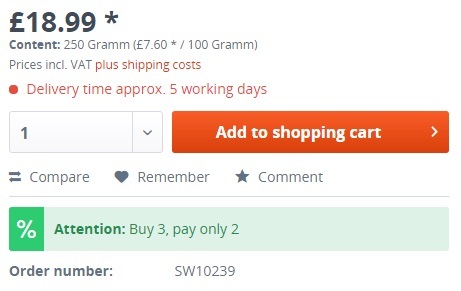 For this example "Buy 3, pay only 2". 7. Define how many items need to be purchased so that the promotion activated. In this example, we need 3 items to make the promotion valid. 8. Define how many items should be counted as free gift. Here one item is free when three are purchased, so one is entered. 9. Write a brief description, which will be displayed on the product detail page as a small box under the “Add to cart” button. 11. Switch to the “Promotion rules” tab. 12. Define a product rule, which appears in the definition mask below. 14. Finally save your promotion. After saving it will appear in the frontend. 1. First define the type of promotion. 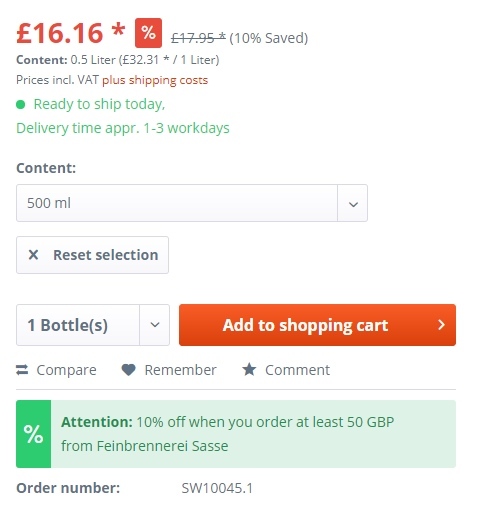 In this example we need to set the mode to “Products: percentage discount”. 6. Enter the text that should be displayed on the badge. 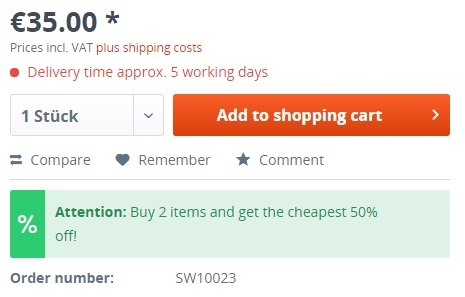 For this example "Buy 2 items and get the cheapest 50% off!". 7. Define the value of the discount on the second product. It’s 50% in this example. 8. Define how many items need to be purchased so that the promotion activates in the shopping cart, which is 2 in this example. 9. This setting means that this promotion can only be used once per shopping cart. 10. Write a brief description, which will be displayed on the product detail page as a small box under the “Add to cart” button. 13. Define a product rule, which appears in the definition mask below. 14. Now you define the rule itself. In this example it is: Category: Name = Teas and Accessories. You can fill in the individual values themselves (divided by "|" or click on a selection and pick out the desired entry from a list. 15. Finally save your promotion. After saving it will appear in the frontend. The scaling of the price was registered >1 – for this reason, it is not overwritten because we do not know if the customer wants to buy the second product. However, if the customer does, the promotion will be credited in the shopping cart. 1. First you need to define the type of promotion. In this case, it needs to be set to “Shopping cart: percentage discount”. 6. Enter the text that should be displayed on the badge. For this example "5% discount from 100 Euro". 7. Define the value of the discount, which is 5% in this example. 10. Switch to the “Promotion rules” tab. 11. Define a basket rule, which appears in the definition mask below. 12. Now define the rule itself. Here it will be: Total >= 100. 13. Finally save your promotion. After saving it will appear directly in the frontend. 1. First you need to define the type of the promotion. In this case we need to choose “Free items”. 7. Here you can search for your free item that will be offered in the frontend. In this example we are choosing Merhzwecknudeln and an oil change. 11. Define a shopping cart rule, which appears in the definition mask below. 12. Define the rule itself. In this example it is: Number of products >= 5. The slider uses the same styling as the “Premium items” slider. When “Premium items” is being used, it will affect the free items slider! 1: Choose the promotion mode, in this example use "Products: percentage discount". 2: Choose a name for your promotion, this name will also be used in the cart. 3: Activate this checkbox, when you want to tease this promotion in the listing using a badge. 5: Choose a order number for your promotion. 6: Write a text for your teasing badge. 7: Set the value of the promotion, for this example we use 10. 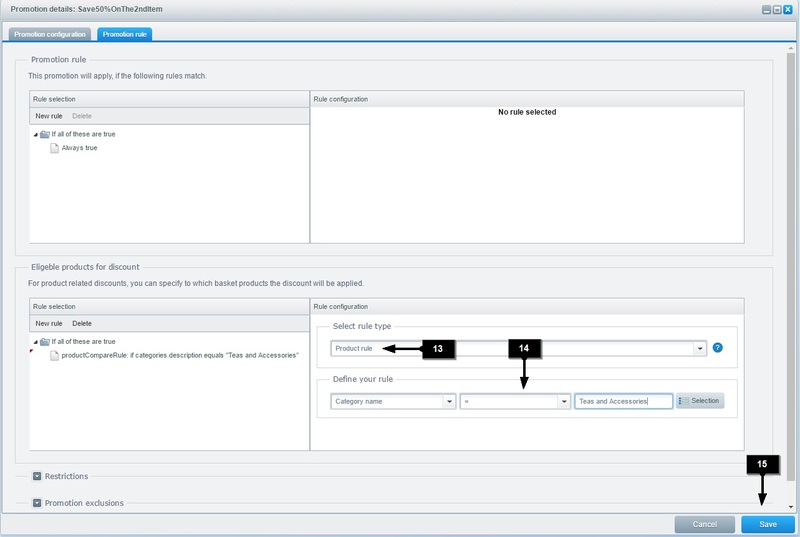 8: Activate the option "Refer promotion rules to product rules". 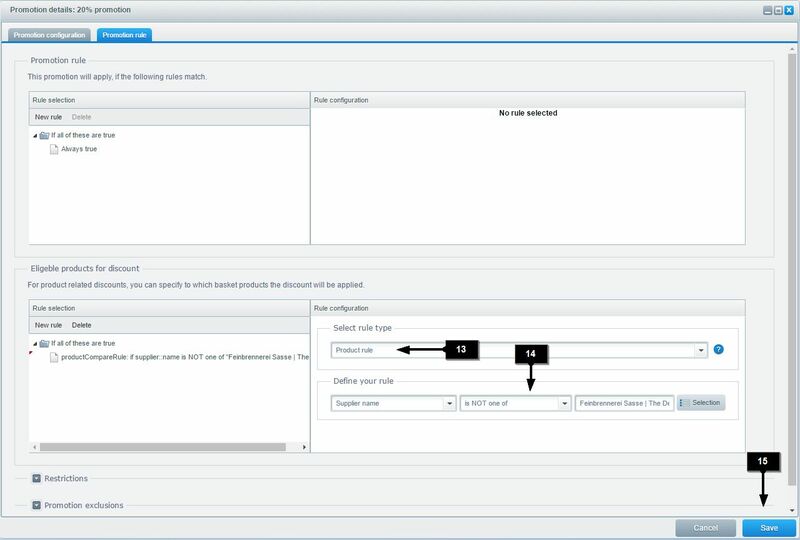 9: Write a description for your promotion, this will be displayed at the items detail page. 11: Switch to the tab "Promotion rule". 12: Create a shopping cart rule. 13: Configure your shopping cart rule, for the example we use Total price >= 50. 14: Now create the product rule. 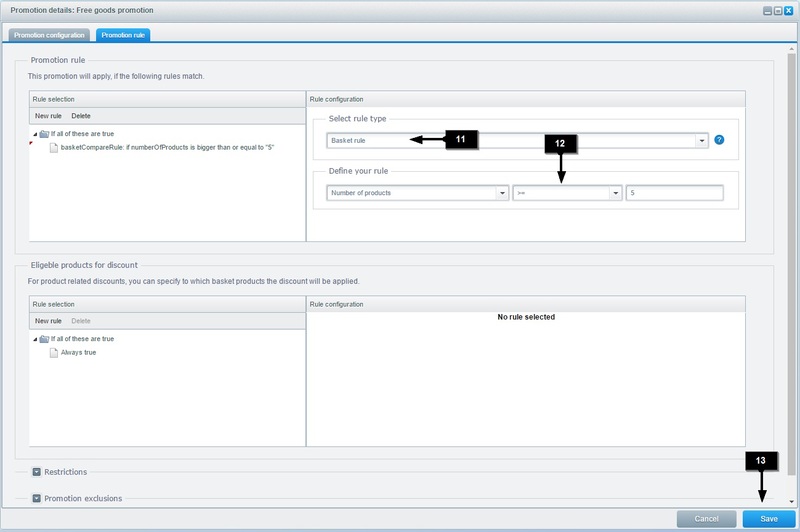 15: Configure your product rule, for the example we use Supplier name = Feinbrennerei Sasse. 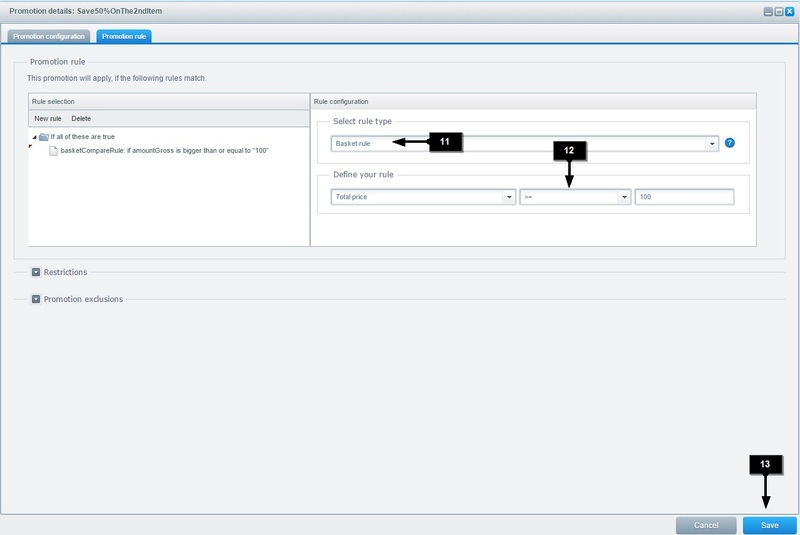 Here you can find some examples how you can affect using smarty commands the output in the summary and the detailed description. If you leave the "Badge text" empty, Shopware will fallback to "Campaign" for english and "Aktion" for german. The language variants will only fallback to their own snippet, so english will only fallback to "Campaign" and german will always fallback to "Aktion"!